Caledonian Optical and SHAW Lens have partnered together to bring optometrists the first major lens innovation since the introduction of freeform digital lenses. SHAW Vision “Binocular by Design” technology can be applied to Caledonian Optical’s ZONE range of freeform, digital lens offerings. Dr Peter Shaw, Developer of the SHAW lens system added: “As an optometry student I was taught how to solve aniseikonia – but the maths needed to design lenses lens was arduous so I invented an automated computerised design method. Over the past 10 years, I’ve been successful in making very complex lens design technology easily integrated into every eye care practice. “The SHAW lens uses doctor measured motor fusion (vergence) limits and sophisticated maths to create lenses that takes into account how the eyes move together as it balances the image sizes. This solves many distortion problems. As a result, many patients report better vision comfort and fewer headaches. 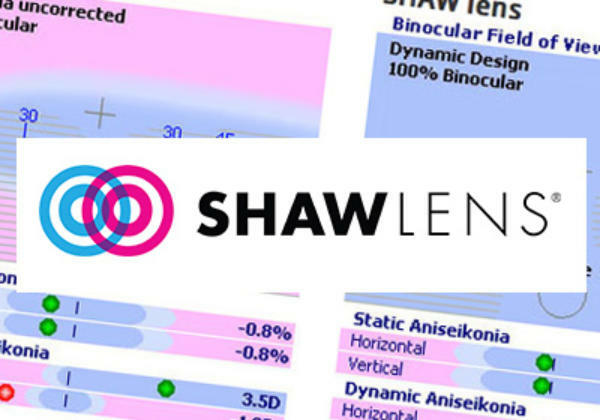 Opticians interested in finding out more about the benefits of the lens can participate in a free webinar to learn how to prescribe and fit SHAW technology in their practice. Plus Caledonian Optical are offering a new users a complimentary pair of lenses to demonstrate the benefits. To order SHAW lenses in the UK, email Caledonian Optical at info@caledonianoptical.com or call 01224 596 006.